BOOK YOUR Aura Cozumel VACATION ONLINE TODAY! 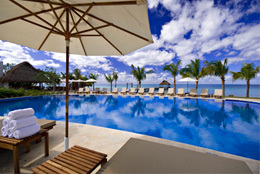 Aura Cozumel Resort Wyndham Grand Bay is a tribute to the senses, to the surreal. A storybook setting in the Cozumel jungle by the Caribbean sea, surrounded by sacred Maya Ceiba trees and lavish gardens. At Aura Cozumel you're the main character in a journey through legends and myths. As part of an exclusive collection of Boutique Hotels managed by Islander Properties, Aura has been recently incorporated to Preferred Hotel Group, a distinguished group of hotels recognized for its high standards of quality and service world-wide. 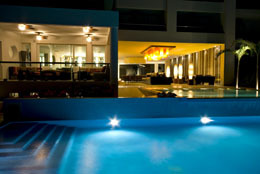 Aura is the first hotel in Cozumel with this important distinction. A classic avant-garde style combined with a creative use of wood, stone, marble and tapestry ensures that the 87 luxury suites harmonize with the local surroundings. Our seven spacious guestroom categories are characterized by personalized details that cater to uncompromising guests seeking the ultimate vacation escape. 38 well appointed spacious guestrooms each with 1 king or 2 queen size beds and a 32” flat LCD screen TV. The suites offer 753 square feet of space and spectacular views of the ocean and pool from an ample balcony or terrace. Bathrooms feature separate bath tub and/or walk in shower, marble vanity tops and premium signature bathroom amenities. All Ocean View Suites are located on 1st or 2nd floor. 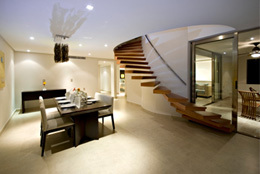 20 very tasteful furnished, spacious rooms each with a king size bed and 32” flat LCD screen TV. All suites offer 753 square feet of space, spectacular views of the ocean and pool as well as direct access to a grandiose interconnecting pool via an ample terrace. Bathrooms feature separate bath tub and walk in shower, marble vanity tops and premium signature bathroom amenities. All Swim Up Suites are located on the 1st floor. 20 spacious rooms each with a king size bed and 32” flat LCD screen TV. All suites offer 1,000 square feet of space, spectacular views of the ocean and pool from an ample balcony as well as direct access to a private solarium and private pool on the upper level. Bathroom features separate bath tub and walk in shower, marble vanity top and premium bathroom amenities. All Private Solarium and Pool Suites are located on the 3rd floor. 2 high class two bedroom suites offering 1500 square feet of living and dining areas with spectacular views of the ocean and pool from an ample balcony. Each bedroom features a king sized bed, 32” flat LCD screen TV and leads to a separate on-suite bathroom. Bathrooms include walk-in shower, marble vanity tops and premium signature bathroom amenities. 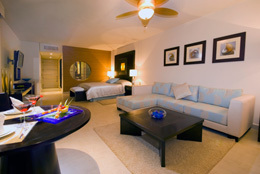 All Two Bedroom Ocean View Suites are located on the 2nd floor. 3, two bedroom suites offering 1500 square feet of living and dining areas, spectacular views of the ocean and pool from an ample balcony and direct access to a private solarium on the upper level. Each bedroom offers a king size bed, 32” flat LCD screen TV and leads to a separate on-suite bathroom. Bathroom features separate bath tub and walk-in shower, marble vanity tops and premium signature bathroom amenities. All Two Bedroom Solarium Suites are located on the 3rd floor. 2 luxurious, two bedroom suites offering 1500 square feet of living and dining areas, spectacular views of the ocean and pool as well as direct access to a lazy river and interconnecting pool via an oversized terrace. Each bedroom offers a king size bed, 32” flat LCD screen TV and leads to a separate on-suite bathroom. Bathrooms feature separate bath tub and walk-in shower, marble vanity tops and signature bathroom amenities. All Two Bedroom Swim Up Suites are located on the 1st floor. 2 luxurious, two bedroom suite with 2130 square feet of living and dining areas, spectacular views of the ocean from an oversized balcony and direct access to a private solarium with a 25 x 15 feet swimming pool on the upper level. Each bedroom offers a king size bed, 32” flat LCD screen TV and leads to a separate on-suite bathroom. Bathrooms feature separate bath tub and walk-in shower, marble vanity tops and signature bathroom amenities. All Two Bedroom Private Solarium & Pool Suites are located on the 3rd floor. Enjoy our superb sandy beach that stretches 500 feet along the entire length of the resort, the prefect destination for your dream wedding. Just a few steps after our fresh, cool and welcoming reception area lies a striking iridescent-tiled water mirror preceding the first of our very inviting swimming pools. Those who enjoy unadulterated beauty shall delight in observing our central island of colorful flowers and exotic plants that envelops the crystal clear lazy river flowing into our grandiose interconnecting pool with various sections. Perfect for relaxation, Aura also features a hydro-massage Jacuzzi in the central pool area and two in our solarium bar Las Brissas where you can savor the most magnificent Cozumel sunsets whilst enjoying great company and one of our specialty Margaritas. Aura has two fabulous restaurants; Isola – meaning island in Italian – where guests can enjoy gourmet Italian-Mediterranean fusion cuisine created by an experienced team of internationally qualified chefs and Hava Grill – the word Hava means Aura in Turkish – serving truly delicious seafood cocktails and light Mexican-Caribbean delicacies by day and select grilled cuts of fresh meat, fish and seafood by night. The resort also offers three bars – beach, lobby and solarium – which are perfect for relaxing with a specialty Martini enjoying Cozumel’s breathtaking sunsets. Room Service is available. Over the delicious a la carte breakfast you can choose from the freshest ingredients; made to order omelets, Mexican style eggs, a grand variety of natural fruits and freshly prepared juices. Lunch is also a la carte and combines Mexican and Caribbean flavors. 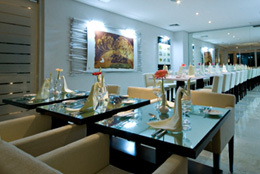 Discover the essence of Mexican cuisine with a touch of international gastronomy. Enjoy an exquisite a la carte dinner at Isola, the perfect intimate restaurant specializing in signature gourmet Italian-Mediterranean fusion cuisine created by an experienced team of internationally qualified chefs. Isola offers a blend of flavors and spices that provoke a unique and genuine experience, combining the best local and international products within an atmosphere that will enrich the senses. Isola dress code: smart-casual, men - collared shirt, no beach attire or flip-flops sandals . Hava, meaning Aura in Turkish, reaffirms the concept of Aura Cozumel, where we put our energies into your utmost rest and relaxation, whilst simultaneously dazzling the finest of palates. Throughout the day you can enjoy our truly delicious seafood cocktails, freshly made pizza and light Mexican-Caribbean delicacies. 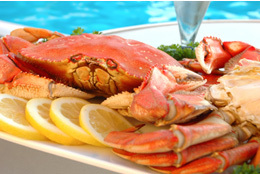 In the evening you will find a select variety of fine grilled cuts of fresh meat, fish and seafood. No dress code is required. From 4:00 to 10:00 PM you can enjoy a striking view across the Caribbean Sea and its incomparable sunsets, whether you are in the delightful lounge area, sitting at the oval bar or relaxing in one of the solarium’s Jacuzzis. 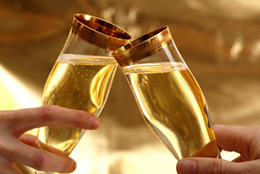 Brissas bar boasts an elegant lounge with an extensive Martini menu. No dress code is required.